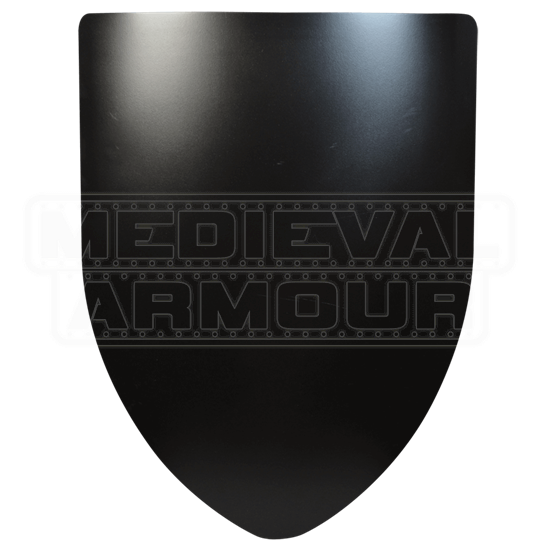 The Plain Steel Battle Shield measures 18 inches across and 24 inches high. 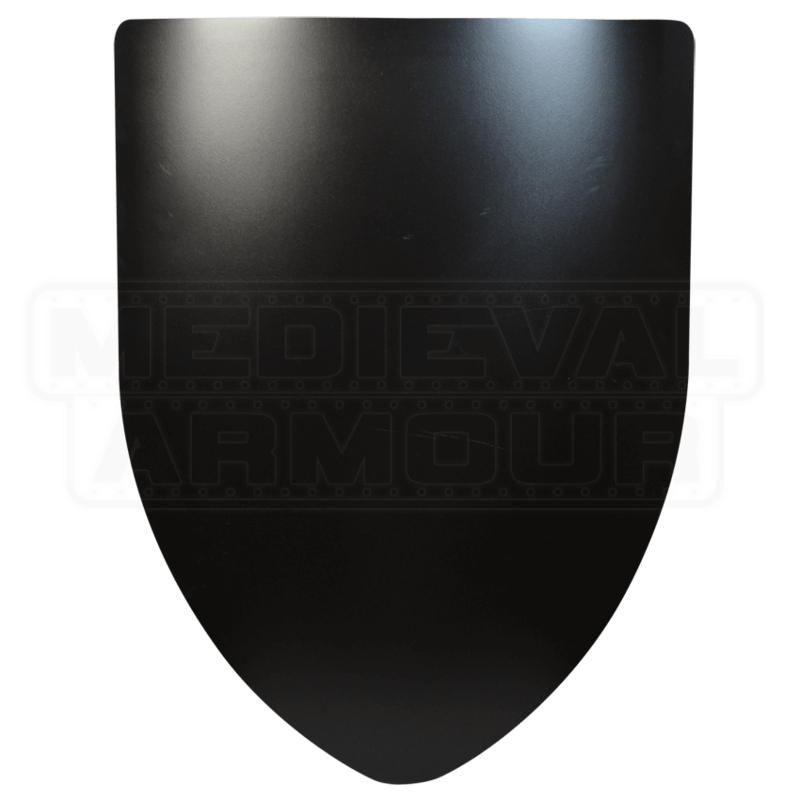 This SCA shield is constructed of 16 gauge steel and has a curved shape that represents a classic medieval heater shield. The plain steel battle shields are hand painted for a smooth black finish and then sprayed with polyurethane to preserve the paint. The Plain Steel Battle Shield comes in a wall display version with a chain from which to hang it or a hand held, battle-ready version with heavy duty, 1.5-inch leather straps on the back. Order the version that best suits your needs. The war is over. Our queen calls forth a celebration. Appear before your noble leader in full battle array to receive praise for your chivalrous deeds. 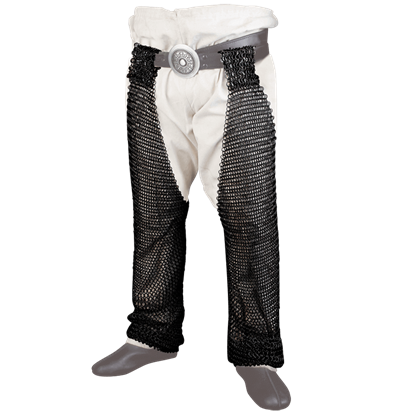 Let your knightly legs be finely clad in the Darkened Chainmail Chausses. 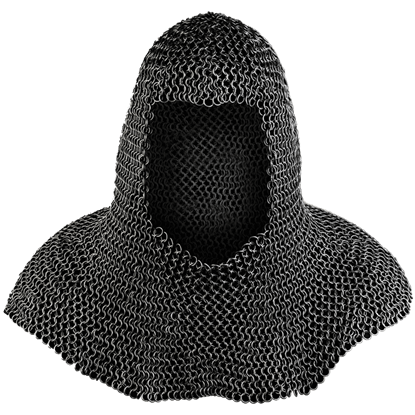 Called upon to defend your realm, you place the Richard Blackened Chainmail Coif over your padded arming cap and prepare for the battle of your life. 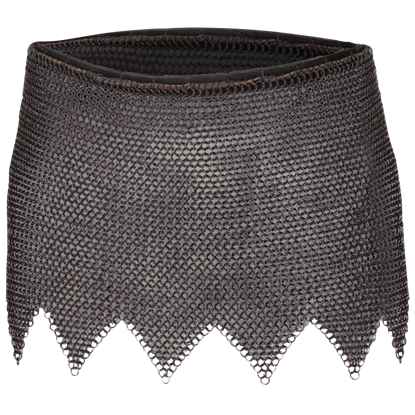 This steel chainmail coif has been chemically treated to achieve its darkened look. 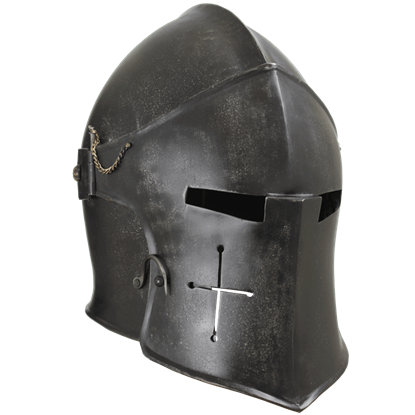 Barbute helmets did not have visors, although the needs of the warrior are what dictate the evolution of the helm. This Epic Dark Visored Barbuta Helmet is as protective as a typical barbute and then-some, thanks to the visor. The playful and peaceful spirit of the courts is a delightful contrast to the raging battlefield. A hard-earned victory calls for merriment. Let the villagers praise the proud soldier draped in the Richard Darkened Chainmail Skirt. Awake! Make Haste! The castle is under siege. The good king and queen are in peril. Prepare yourselves and be girded with a strong defense. 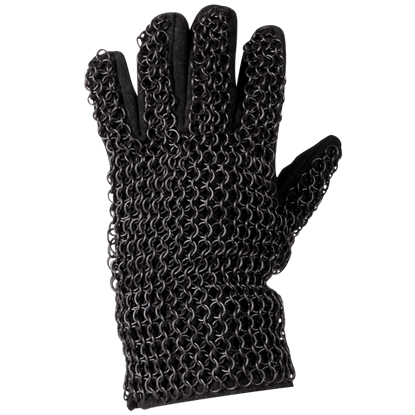 Wisely guard your chivalrous hands with the Richard Darkened Chainmail Gauntlets.